I fell in love with Peter Pilotto as soon as I laid eyes on their first collection....can't say the same about Kipling (I just don't get what's up with the monkey?!). 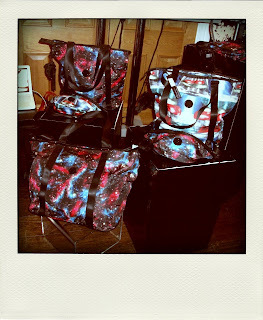 So naturally I was a bit skeptical about the two collaborating to create a new bag range. However I was pleasantly surprised when I attended their presentation on Tuesday evening. 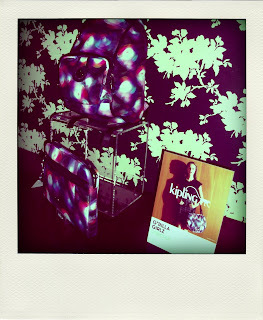 The bags were fun, practical and on-trend - I would happily carry around my stylist kit or laptop in one of them. Kipling's new leather range wasn't too bad either! The collection will consist of 11 bags and 5 accessories in Pilotto's strong trade mark galaxy and machine prints. The inspiration and idea behind the prints was "an intergalactic traveller, a sort of otherworldly nomad who is exploring and discovering". The collection will be exclusively available to buy at Selfridges beginning of September and then from the 3rd week of the month at Kipling stores and online. Kipling and Peter Pilotto are already working together on their SS11 collaboration. I won't lie, Im looking forward to it - furry monkeys and all!